Cecil Balmond unveils new sculpture, Strange Attractor, at the Museo Salvatore Ferragamo, Italy, as part of their Equilibrium exhibition opening 19th June 2014! 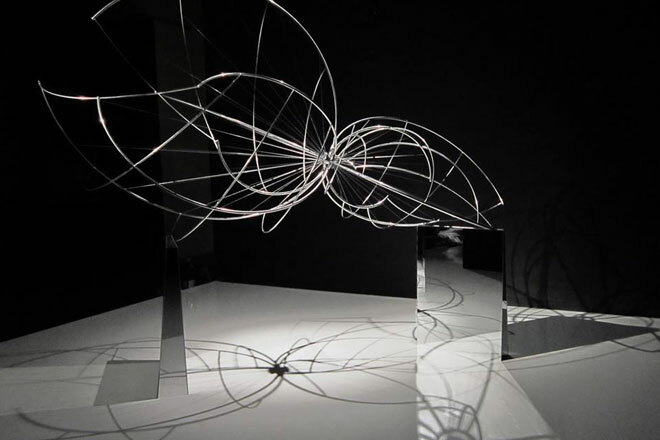 Invited to create a work of art exploring the theme of ‘equilibrium’ for Museo Salvatore Ferragamo, Cecil Balmond has produced Strange Attractor; a sculpture inspired by the complexity and strength of the muscles and tendons in the human foot. Formed from polished stainless steel and precariously balanced, Strange Attractor appears as a series of arcs that orbit around a floating core. Reflecting the surrounding light and hues on its surface, the sculpture expresses the dialogue between compression and tension in a vital and elegant balance of linear and curved line.